What can I say? John Tucker has done it again. Another great story with plenty of action, drama, and suspense. 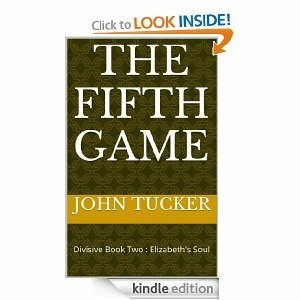 The Fifth Game takes the reader on a whirlwind ride with Dennis Rask and Elizabeth Connors, along with a cast of new and interesting characters. The story starts out as Dennis Rask, aka Den, has planned a new game with a new family. Elizabeth is not happy that Dennis has gone back to his hobby but feels she must help him to show him how much she loves him. I was happy that Elizabeth started to question her love for Dennis. Could she leave Dennis to pursue James, a member of the family Dennis was targeting? This book had me loving the characters and hating them at the same time. I loved Tatty and how she took care of Dennis and Elizabeth, and how she wasn’t afraid to take what she wanted. I was sad when I learned of Frank Bostick’s fate. I was also overjoyed when Dennis finally had his game not go the way he planned. Overall, this was a great book that kept me up all night just to finish it. I will definitely be reading the conclusion to this story when it’s available.